Jowenko B.V. & Industriële Dienstverlening B.V. often has to drill large numbers of holes in concrete to allow reinforcements to be placed (rebars). To meet the demands of our customers, Jowenko has a number of advanced drilling machines. Some of these machines are capable of drilling at any angle (from Ø 25mm to Ø 76mm). These machines are fitted with digital instrumentation that allows the operator to read off the exact angle at which drilling is being done. Jowenko also has two hydraulically powered Montabert wagon drills. 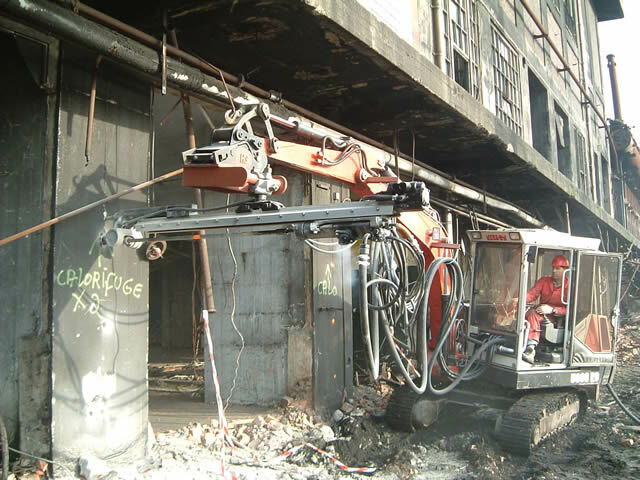 Mounted on a wheeled crane, this provides a great deal of flexibility and guarantees that drilling work can be done very efficiently. These machines also have a vacuum connection for dust extraction. The biggest drilling machine the company possesses is the Tamrock drilling machine, with its own engine to power the caterpillar tracks and weighing 9 tons. The diameters of the holes made by this drill are from Ø 64mm to Ø 93mm, to a maximum drilling depth of about 25 metres. This machine also has a vacuum for dust extraction and can drill both horizontally and vertically.